We had the opportunity to talk comparatively about what is coming out of our respective fieldwork, when Jolynna took a detour through China on her way home from her second round of fieldwork in Trinidad to visit Xin Yuan. We found a number of complimentary themes and parallels from our field sites and our discussions with our informants. Trinidad and the region of China where Xin Yuan is doing her fieldwork are similar in that there are large amount of intra-state migrants (in Xin Yuan’s field site, rural migrants amount to two thirds of the local total population), whose main social networks remain in their home towns. This suggests that these groups may need social media mostly in terms of developing social networks in their area of destination as well as for their contacts who remain in their home towns. Of course, it is too early at this stage to talk about the social consequences of the appropriation of social media among migrants, which we definitely aim to address at the end of the project. However, some very obvious parallels did express themselves clearly enough in Jolynna’s short research visit, and pushed us to think WHY. For example, we both found that there are very few to no people over the age of 50 using social media, or even seem interested in using social media (in Xin Yuan’s case, she found so far, that nobody over the age of 45 is using social media and Jolynna has only one informant over 60 who uses Facebook). We discussed a couple of factors to why this is the case: A) illiteracy (especially in Xin Yuan’s case amongst older rural migrants in China); B) older people as being more technophobic; and C) the dominance of face to face relations for older people. The first two factors are to do with people’s capability and willingness to use digital technologies, however the last reason has more to do with people’s perception of social life and the social normativity around the questions such as “which kind of social connection really matters in one’s everyday life”. Firstly, in both of our field sites, older people are more invisible in the smartphone market. From her observations and discussions with informants, Xin Yuan has found that many older locals and migrants are illiterate and they are mostly interested in a phone that can meet the basic functions of making and receiving calls. They are generally not interested in smartphones because they ‘don’t see the need’. 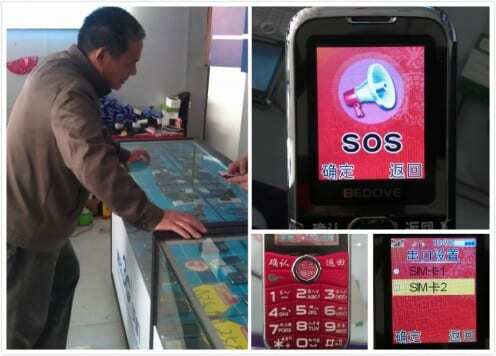 Their need for the main functions of making and receiving calls plus the extra need for easier usage is reflected in the phones, which is called the ‘old people phone’, available in the industrial town at a very low price (around 300 RMB, equals to 30 pounds). This kind of mobile phone is designed for easy usage, buttons and screens are larger, the screen itself is not cluttered with graphics, the phone also allows for two SIM cards, there is a clear SOS button, which calls the number of the person’s choosing if they need to reach them urgently and the incoming call alert is particularly loud (see figure above). The phone also doesn’t need to be charged as often as a regular phone, battery life can last up to a month as older people here tend to associate the phone with a landline telephone, which remains plugged in and doesn’t need to be charged. Yet, in Trinidad, there are very few phones especially for older people on offer. Landline phones with larger numbers can still be found, but mobile phone shops cater more for younger customers, they have all sorts of ‘fad’ phones on offer, of different colors and camera functions to upload photos directly onto SNSs and the newest iPhones, Samsung Galaxies and Blackberries dominate display cabinets. More so, older people in Xin Yuan’s field site don’t seem to have the desire to make friends beyond their immediate living areas, where they keep mainly face-to-face communication. Xin Yuan suggests that this reflects the old saying that “yuanqin buru jinlin” (close neighbours are better than faraway relatives), perhaps because it is only their neighbors that they would turn to for day to day support, which they can’t rely on faraway relatives for. It is a very pragmatic attitude towards social relationships, since one can only survive within a stable social network where they can turn for help in a tough ‘real life’ situation. It is no surprise to find that the social networks of older people are more or less shrinking in both Jolynna and Xin Yuan’s field sites. Like China, Trinidad is an extremely family-oriented society, but there is more of a pattern that the elderly are engaged more in face-to-face relations with their immediate and extended families, unless their relatives live abroad. Children of the elderly visit very often, everyday or once every two days if they live nearby and at least in El Mirador, sociality for older people still resolves more around the town market place, which is a bustling hub on the weekends. This project sought to explore social media through an anthropological lens, where, as Daniel Miller emphasized in an earlier post, context is everything. So far, in our respective field sites of a semi-urban town in Trinidad and an industrial town in China that is a hub for rural migrant workers; older people aren’t using social media as much as we might have thought. Social media doesn’t seem to be a priority for a demographic of people whose relationships are predominantly face-to-face in closer and more immediate circles of neighbours and family, perhaps in the face of smaller, more localised social networks or a lack of the need or desire to make and keep new friends.